I am so excited to share with you a fantastic Julep giveaway! As you all may have guessed, I am a huge fan of Julep and the Julep Maven program. I just love my monthly box of nail-mail, and I would like to share that with you. 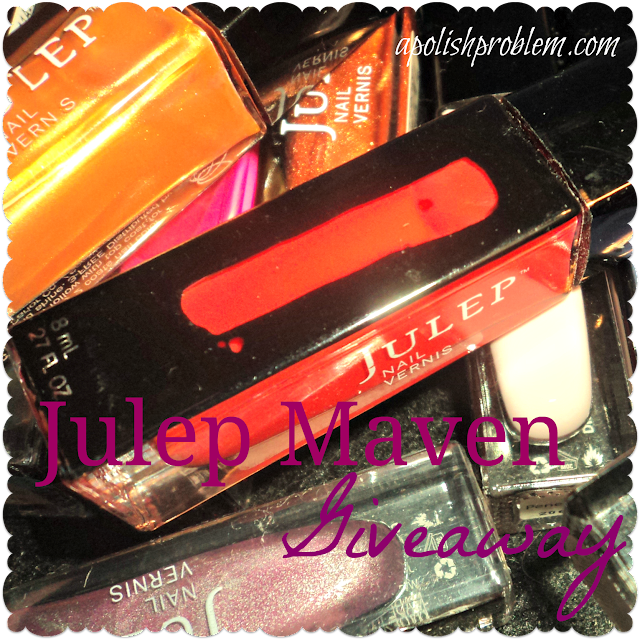 Thus, I have paired with Julep to give away an introductory Maven box. Like all Maven boxes, this box is a $40 value, and you can see examples of what you will find inside the introductory Maven box by clicking here. Personally, I'm a Bombshell, that occasionally switches it up to It Girl, but if you win, you can select your own Maven personality. To enter the giveaway, simply click below using the Rafflecopter widget. All entries must be made via Rafflecopter and giveaway will end on 6/29/2012. Good Luck and thank you so much for entering! For more information about becoming a Julep Maven please click here. Also, be sure to use code MAVENINTRO to receive your first Maven box, including shipping, for $0.01! I haven't tried a Julep polish yet but their colors look very pretty. Awesome giveaway. Thank you so much!